" 2019 The 5th International Conference on Industrial and Business Engineering (ICIBE 2019) "
Welcome to the official website of the 2019 The 5th International Conference on Industrial and Business Engineering (ICIBE 2019), which will be held during September 27-29, 2019 in Hong Kong. ICIBE 2019 aims to bring together researchers, scientists, engineers, and scholar students to exchange and share their experiences, new ideas, and research results about all aspects of Industrial and Business Engineering, and discuss the practical challenges encountered and the solutions adopted. The conference will be held every year to make it an ideal platform for people to share views and experiences in Industrial and Business Engineering and related areas. For more details of the conference schedule, please feel free to contact us at icibe@iedrc.net. The full version of program will be given in October. All honorable authors are kindly encouraged to contribute to and help shape the conference through submissions of their research abstracts, papers and e-posters. Also, high quality research contributions describing original and unpublished results of conceptual, constructive, empirical, experimental, or theoretical work in all areas of Industrial and Business Engineering are cordially invited for presentation at the conference. The conference solicits contributions of abstracts and papers that address themes and topics of the conference, including figures, tables and references of novel research materials. It is also our privilege and pleasure to invite you to participate as sponsors, exhibitors, or Audience. We hope that the conference results in significant contributions to the knowledge base in Industrial and Business Engineering scientific fields. conference proceedings/indexed by EI Compendex and Scopus. Accepted papers by ICIBE 2019 will be published in the International Conference Proceedings, which will be sent to be indexed by EI Compendex and Scopus. 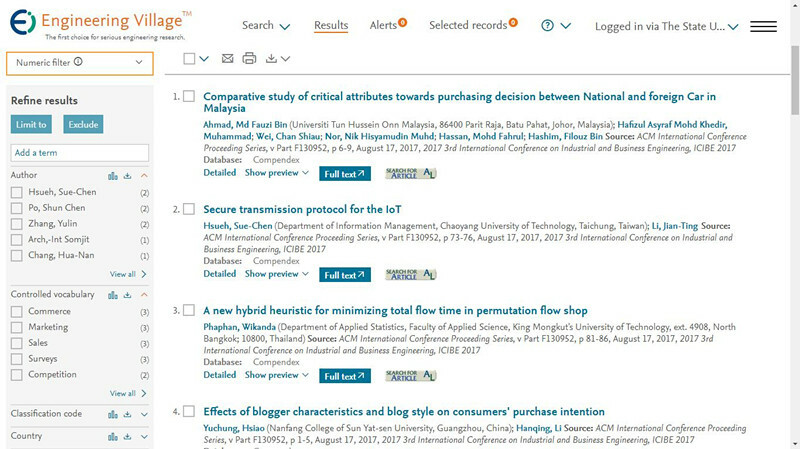 The proceedings volume will also be submitted for potential indexing to SCOPUS. The conference proceeding of ICIBE 2018 has been indexed by EI Compendex and Scopus. ICIBE 2019 will be held in Hong Kong. Welcome to attend the conference. 1. For Author, your should submit full paper to ICIBE 2019, which will be published and invited to present orally at the conference. 2. For Presenter, you can deliver a presentation on ICIBE 2019, but the presented manuscript WILL NOT be published. Abstract is necessary to submit. 3. For Listener, you can participate and attend all the presentation sessions only, neither making presentation nor having paper published.